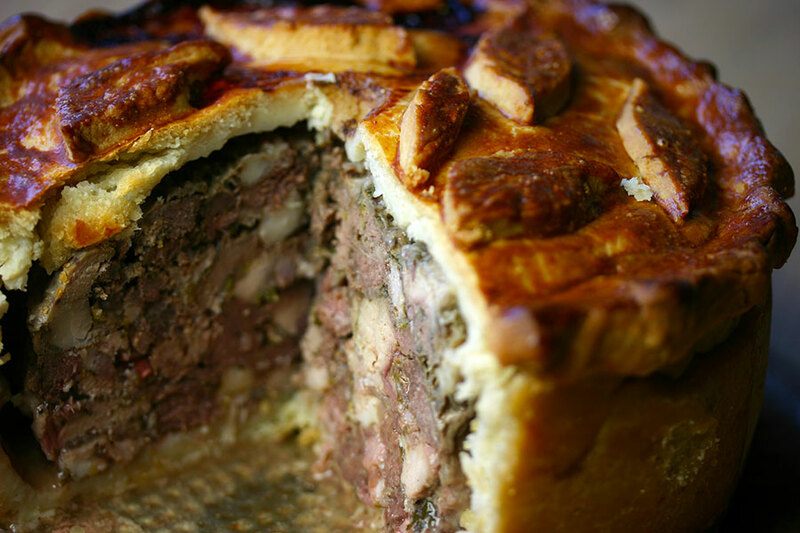 My heart sank when the Great British Bake-off contestants were set the task of making a raised game pie. That may be so, but I found the idea pretty daunting. It took me a couple of weeks to raise the nerve to tackle one. As I happened to have a pheasant in the freezer, I opted to use a mixture of that and venison for the meat. I briefly considered buying a raised pie tin like the contestants used, but it seemed a waste for something I may only use once. Instead, I went with a 20cm springform cake tin. While I would never describe the process as “amazingly straightforward”, it was a surprising amount of fun. I particularly enjoyed working with the hot water pastry, which seems more forgiving than regular pastry. Preheat the oven to 400°C/200°F. Grease a 20cm spring-form cake tin (about 7cm deep) with lard. In a large bowl, mix together the shallot, garlic, game, pork belly mince, diced bacon, Madeira, spices and herbs. Season with salt and pepper. Using your hands, mix all the ingredients together. For the hot water crust pastry, combine the flours in a bowl, add the butter and rub in by hand. In a small pot, heat 200ml of water, the salt and lard until it just boils. Pour the mixture into the flour and mix. Once cool enough to handle, tip onto a lightly floured surface and knead into a smooth dough. Working quickly, cut off two-thirds of the pastry, roll it out and use to line the tin, leaving any excess hanging over the edge. Ensure there are no cracks or holes. Roll out the remaining pastry for the lid. Spoon the filling evenly into the tin, pressing it firm. Brush the edge of the pastry with beaten egg, then position the lid on top. Pinch the edges to seal and trim off the excess pastry. Brush the top with egg. Make a hole in the middle of the lid for steam to escape. 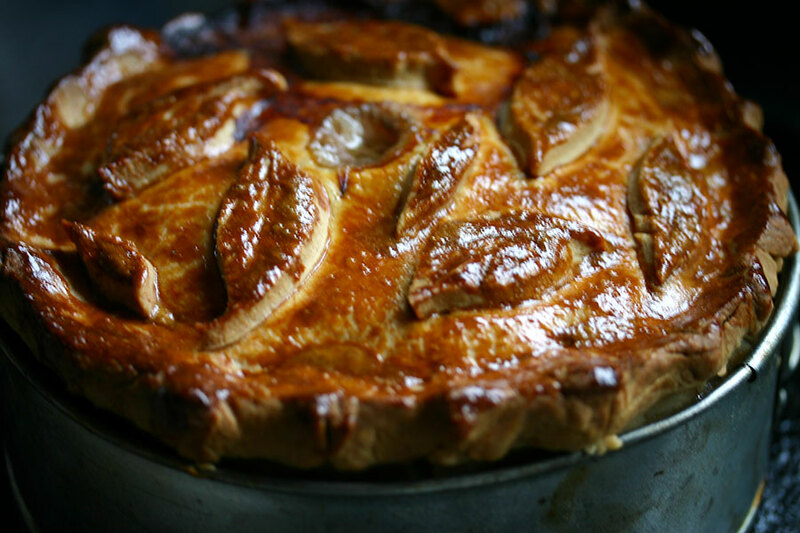 Place the pie on a baking tray and bake for 30 minutes. Turn the oven down to 325F/160C and bake for a further 1¾ hours. Allow the pie to cool completely in the tin before removing. Serve at room temperature. Oh wow! 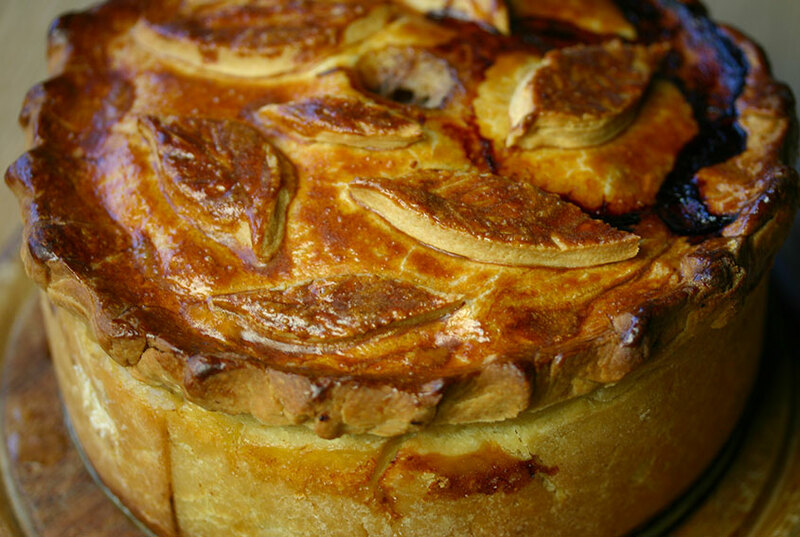 How stunning and delicious does that pie look?! wow!! This looks so good. It’s beautiful! Thank you so much! It was my first time working with hot water pastry and I really enjoyed it. Thank you, Yana — I was very surprised and pleased by how well it turned out!